Cayo Ensenachos, Cuba | The most complete tourist guide! CAYO ENSENACHOS is a tiny island located in the Bahia de Buenavista, off the northern coast of the Cuban province of Villa Clara. It’s the smallest of the "Cayos de Villa Clara" (a.k.a. Cayeria del Norte), a popular beach resort destination that also include the island of Cayo Santa Maria and Cayo Las Brujas. The names "Cayo Las Brujas" and "Cayo Ensenachos" are however less known because this popular destination is often simply reffered as Cayo Santa Maria (its main island). While browsing through this website, you will notice that several of the links in the top menu redirect you to our website about Cayo Santa Maria; this is in ordrer to avoid repeating the information that is common to the three cayos. 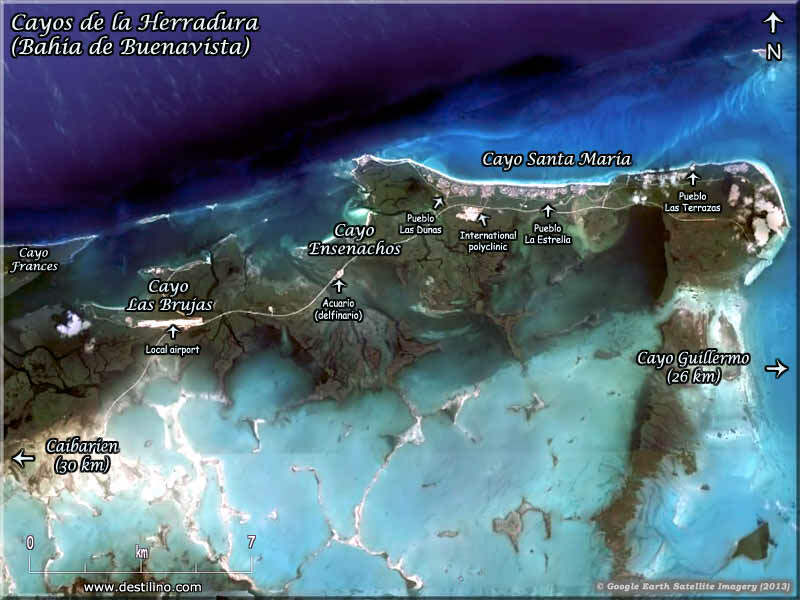 These cays are connected to the main island of Cuba by a 48-km (30-mi) causeway (called "El Pedraplen"), from the coastal town of Caibarien. The entire area is part of a large UNESCO recognized nature reserve called "Reserva de la Biosfera Buenavista". Visit the section Location & Maps for more details. Cayo Ensenachos is an area of pristine natural beauty, this horseshoe shaped key boasts two of the most dazzling beaches in Cuba, Playa El Megano and Playa Ensenachos, see our Beaches section for more details. The calm and crystal clear waters are ideal for bathing and water sports, and beautiful offshore reefs provide impressive dive sites. The area is also a world-class location for fishing. The island is a refuge for more than 60 endemic species of flora and fauna. This destination is perfect for those who want to get away from it all, in a bucolic environment, but without sacrificing the pleasures of comfort and premium services. This is a One-Island-One-Hotel concept, making the Iberostar Ensenachos a private retreat for couples and families. But be prepared to do some walking, this resort has the largest and most beautiful gardens of all the hotels in the Cayos of Villa Clara, and also the largest crew of gardeners! They really took advantage of the natural surroundings by integrating large areas of lush Caribbean gardens throughout the property. This 5* hotel is divided in three sections: PARK-SUITE for families, where children can enjoy a water park and a pirate ship theme playground; the SPA-SUITE for adults (18+) where their fabulous wellness center (spa) is located; and the GRAND-VILLAGE section composed of luxury villas, each with a jacuzzi on the terrace. There are two international airports serving the King's Gardens arhipelago: the Santa Clara Airport, code SNU (Aeropuerto Abel Santamaria) which serves the western cayos (Cayo Santa Maria , Cayo Ensenachos and Cayo Las Brujas) and the province of Villa Clara; and the Cayo Coco Airport, code CCC (Aeropuerto Jardines del Rey) which serves the cayos of the eastern part of the archipelago (Cayo Coco, Cayo Guillermo, Cayo Paredon, Cayo Cruz). 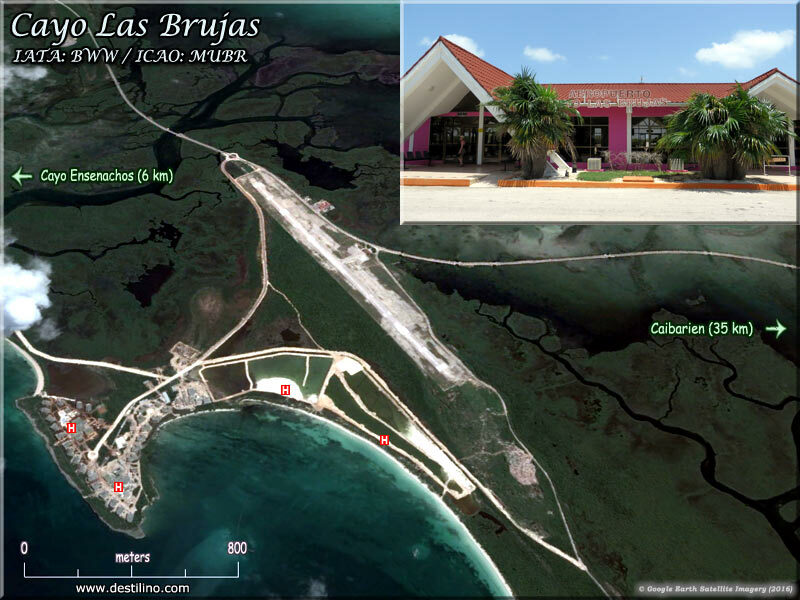 There’s also a local airport on Cayo Las Brujas for domestic flights; unfortunately the runway is too short to accomodate large aircrafts. Visit our Airports section for more details. With the nearest international airport being located in Santa Clara (the capital of the Villa Clara province), it takes about 85 minutes to reach Cayo Ensenachos from the Abel Santamaria Airport; the first 50-60 minutes are through the Cuban countryside and the towns of Camajuani, Remedios, and Caibarien; and the last 20-30 minutes are on the causeway (pedraplen) with the sea on both side. We had the chance to visit the secluded paradise of Cayo Ensenachos a few times before the construction of the hotel, which opened its door in 2005. It was back then a completely virgin island accessible from the causeway by a 1-km long sandy trail. Both beaches were almost always deserted, and we enjoyed snorkeling where now is located the nautical center. We were not really surprised when we learned that a 5* hotel was going to be built there; it's such a perfect setting. For the nostalgic, click the following link to see pictures taken in 2002 (before the hotel was built). 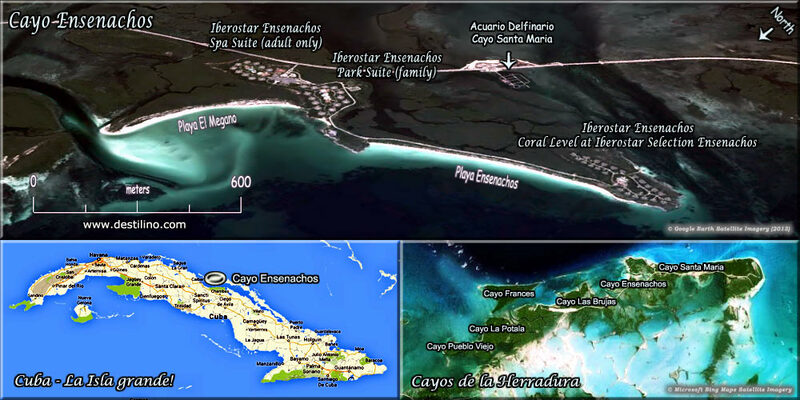 Our cayoensenachos.net website has been online since 2005, and our cayosantamaria.info website since 2002. They contain thousands of photos and hundreds of web pages about the Cayos of Villa Clara and the “Jardines del Rey”. Our websites are updated regularly, and we humbly believe they are the most complete and detailed source of information about these Cuban destinations. Having no business relationship (or otherwise) with any hotel chain or the Cuban government, our websites are created simply and solely for the purpose of keeping you informed about this beautiful Caribbean island that we had the chance to visit dozens of times.